After months of development, Jennifer and I are ecstatic to finally reveal this new website. We still have a ton of new features (AND FREE STUFF) we’ll be adding in the coming weeks and months, but decided to go ahead and launch the site now so you can be a part of the ongoing development. Sign up for our newsletter! This is the first newsletter that we’ve ever produced just as us (Greg and Jennifer). We want to be able to truly build up The Catholics Next Door community and provide serious and silly stuff, and regular surprises. Look at the website on your smartphone and discover how easy it is to pick shows to listen to on the go! Comment on posts and podcast episodes more easily! Like what you heard this week? Leave a comment! Like a podcast episode? Now you can easily share it on your Twitter and Facebook feeds directly from our site. Check out the entire back catalog of shows directly from our site. A few secrets to be revealed soon! Click here to go look at the new home page and be sure to bookmark the site right now and check back regularly to discover new content! Hi Greg and Jennifer!!! I clicked on the 4 Steps to Better Prayers …. but only received a “error 404 – information has moved” Hopefully this can be fixed. 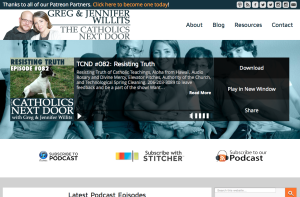 Good luck with the new site … love the podcasts…. Timothy – Good catch! I *think* I’ve fixed it. Try again!